Being a writer has taught me a lot about myself--namely that food is important to me. Sure, I could stand to lose 10 pounds (thanks to the warm chocolate chip cookies I tend to make a bit too often), but it’s more than that. It’s really about the kitchen being the heart of the home. 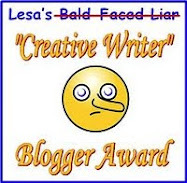 It is in our house, it is in my Lola Cruz mystery series, and while it plays a bit of a lesser role in my new cozy Magical Dressmaking mystery series, it’s definitely there. 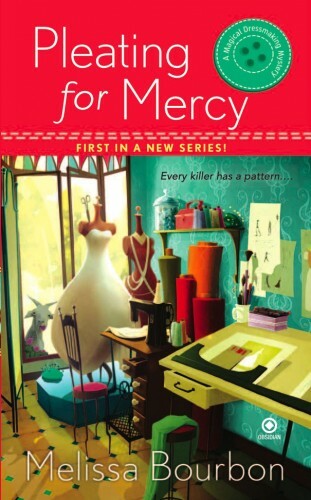 Harlow Cassidy, my heroine/amateur sleuth in Pleating for Mercy (which comes out Tuesday! ), is surrounded by magical charms. Her mother, Tessa, has a green thumb with a checks and balances system. Flowers and plants grow, but so do the weeds. But Coleta, Harlow’s great-grandmother, happens to have a way with goats who are around to eat the surplus weeds. Nana also makes goat cheese (not a personal favorite of mine, but very fun to write about!). Through the goats, food will always be present in these books. There’s a bit of Southern cooking here and there, however, beyond the goat cheese. Fried chicken, sweet tea (another thing I don’t love, but which is quite Southern), fried okra, chicken fried steak, and cornbread. Yum, yum, yum! It’s not like I plan to include food in my books; it just happens. With my Lola Cruz stories, the food is part of the Hispanic culture. It gives background, flavor, and helps create a complete sense of the setting. When I was dating, and then married my husband, I saw just how important food was in the culture. Everything was made and shared with such love. When I created Lola’s world, the cooking was a natural extension of that world. Same with the Southern fare in the Magical Dressmaking mysteries. We all respond to food, and regional food taps into our senses and emotions about a place. It took writing books for me to realize just how I view food--as a cultural element which helps paint a complete picture of a character’s world. I’ll never love sweat tea or goat cheese, but I can definitely appreciate them. And I’m really having fun eating crab cakes, shrimp and grits, making fried okra, and generally experiencing the food I’m infusing my fictitious town of Bliss with. What do you think food brings to the cozy table? Do you have a series you love in which food plays a subtle, yet important role? I like seeing foods in books that I read because eating is a part of life. I also enjoy visualizing the food that is talked about and consumed. A lot of brainstorming and fleshing out clues happens during the meal process between the characters. 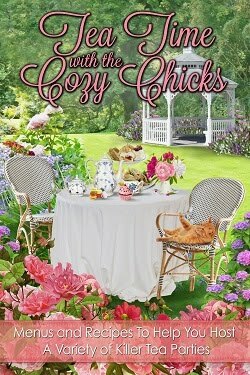 Hi Melissa, welcome to the cozy chicks. I am unfamiliair with your books, but I am sure that will change. 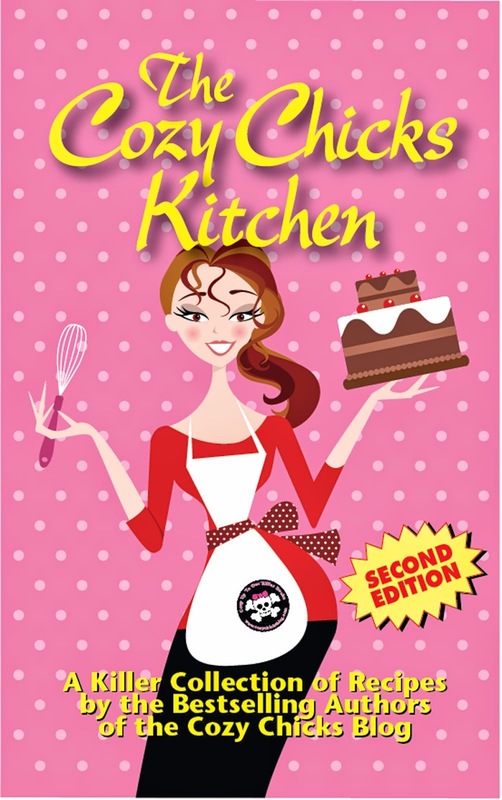 I like cozies where food is one of the main factors like the Hannah Swensen series, or the Goldy Bear catering books. If the occupation of the heroine has nothing to do with food, it still adds to the homely feel of the books, and gives a focus or resting point for the heroine. To tell about her exploits, or such. I like those kind of details. His J.W. Jackson is a retired police officer (like my Dad) and an excellent cook (ditto for my Dad). Jackson stops detecting long enough to put something in to marinate or to smoke freshly-caught bluefish for an amazing sounding-dip. (My Dad fishes too). Sadly, Philip passed away a few years ago but he wrote about twenty great books behind. I love foodie books and there are definitely a lot to choose from! Thank goodness. I also started with Diane Mott Davidson--love that Goldy. 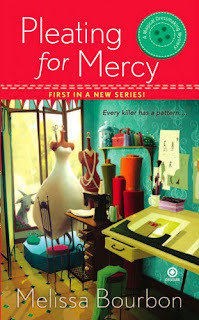 Can't wait to read Pleating for Mercy--sounds wonderful! And I adore the goat on the cover. I'm a sucker for a goat. You have excellent taste, Vickie! This makes me hungry for shrimp and grits and I've never even tasted grits. It just sounds good. I do like food descriptions - cooking and eating in books. I like food, but also the people in the books somehow seem more appealing when they like food. Of course reading about food can make me crave goodies that it would be best if I stayed away from.